A Georgian vicarage, a stone built detached house and a five bedroom family home are among the featured properties in this week’s Harrogate property guide. The Old Vicarge, Aldborough (£995,000, Carter Jonas 01423 523423) is an atttractive late Georgian detached property in the heart of the village, set within a superb private garden adjoining the village church. An immaculately presented, spacious, stone built detached home on a quiet cul-de-sac in the village of West Tanfield is offered for sale by Joplings (01765 694800) priced £545,000. 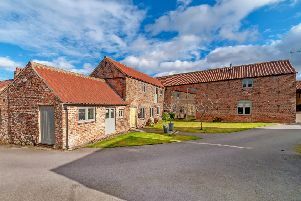 Linley and Simpson (01423 540054) offer for sale a stone built, five bedroom detached family house in the secluded and tranquil area of Barleyfields Terrace, Wetherby. A four bedroom town house on Ashgarth Court, located to the south side of Harrogate, is available to rent for £1,100pcm (Dacre Son & Hartley 01423 877200). Thomlinsons (01937 582748) offer an immaculate two bedroom cottage which has undergone a full refurbishment, tucked away in the quiet backwater setting of Elmwood Terrace, Collingham, for £795pcm. And with bonfire season in full swing, our property writer John Grainger explores the village of Scotton, charting how it changed from a hotbed of treason to a rural idyll over four centuries. Pick up a copy of the property guide, available free in this week’s Harrogate Advertiser series. And check out the property section of our website for full details.